This 7,165-yard, par-72 Jack Nicklaus Signature Golf Course is a true championship course. Its dynamic layout requires golfers to navigate through native Mayan vegetation as well as numerous wetlands and strategically placed bunkers. 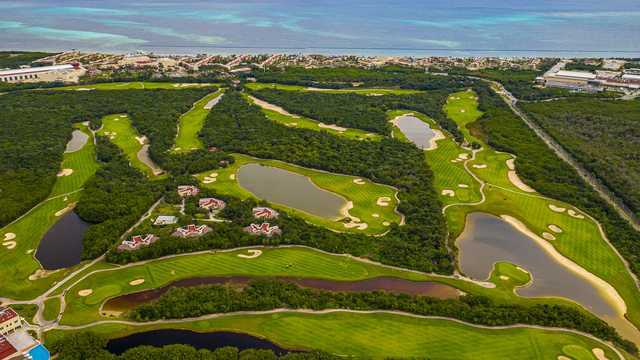 Jack Nicklaus has put his signature on the Cancun-Riviera Maya golf landscape with The Club at Moon Palace. This 7,165 yard, par-72, Jack Nicklaus Signature Golf Course is a true championship golf course that surpasses even the highest standards set by Palace Resorts. With four sets of tees, The Golf Club at Moon Palace will be enjoyed by golfers of all skill levels, as this fantastic layout requires the golfer to navigate not only through the native Mayan vegetation, but also numerous natural wetland waste bunkers that have been strategically placed. Among the notable holes, No.17 is a 141-yard par-3, that plays to an island green. There is no place to bail out, it is either on the green or in the drink. Definitely a hole where you want to step up and hit that shot that you have always dreamed of!! !